Cantina Vieja, Santa Cruz Island [Sp. old winery] is located adjacent to the chapel to the north of the Main Ranch. 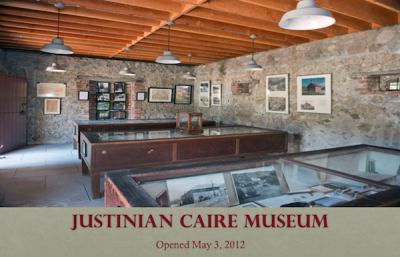 Justinian Caire had the hillside cut away and a stone room built into it to provide coolness for storage of wines. A nearby redwood two-room beekeeper's house was moved and lifted, a balcony and stairs added, to provide a second story to the Cantina. Once the large crushing and fermenting cellars were built across the valley, this cellar became known as the Cantina Vieja. Prohibition stopped the production of wine on the island, and the Cantina Vieja fell into disuse. By the time the Stantons purchased Santa Cruz Island in 1937, the second story redwood rooms were falling apart, and in the 1940s removed, leaving only the first floor stone room. Carey Stanton had long wanted to restore the building, but the project was not done by the time of his death in 1987. 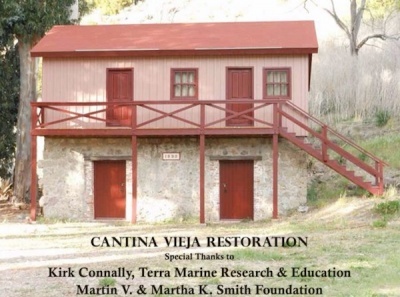 His legacy, the Santa Cruz Island Foundation, undertook the task of this unique restoration and reconstruction, and in 2010 the Cantina Vieja was opened as a museum dedicated to the Caire Family (first floor) and Stanton Family (second floor). Architect, Chris Noll, based architectural drawings for the reconstruction on a handful of historic photographs. Kirk Connally, president of Terra Marine Research & Education, conducted the restoration, personally doing most of the work. Grants from the Martin V. and Martha K. Smith Foundation, the Wallace Foundation, and private contributions made the project possible. February 16, 1920 [SCICo]: “The corn asked for on requisition C26 is to plant in the Domestic, in front of the Cantina Vieja, in front of the silos and in part of the Campo Avuelo at P.H. and at Christy. This corn should be planted the latter part of March but unless we have a great deal more rain, a total of ten inches or more, it is useless to plant corn, as it will not mature. This page was last edited on 28 July 2015, at 08:01.